LG shows off 2014 TV range – and plasma lives on | What Hi-Fi? LG has unveiled its TV family for 2014, with a whopping 42 sets in total. Plasma lives on: LG has stated it is committed to keeping the tech alive. With Panasonic ending plasma production, LG is now one of the few firms still in the game. There will be four ranges (and five sets) in 2014. Elsewhere, there will be eight ranges and 25 TVs of LED/LCD with Full HD 1080p resolution. At least half of those will feature LG’s new webOS smart interface. Ultra HD 4K seems to be gaining momentum, and there will be six LED ranges (and 12 sets) in 2014. The trend of bending TVs is also going strong: there will be 55in, 65in and 77in curved OLED sets, all of which will display 4K Ultra HD. LG is the only company we've seen this year to do TVs that are curved, OLED and 4K. Can't decide whether you want to be stuck with a curved screen? You don't have to. LG is really trying to break its own record of world firsts, and to that end it has made a 77in flexible 4K OLED TV, which allows users to adjust the curvature of the screen with the remote control. It’s not all about the curves, however: LG is releasing the 55in Gallery OLED (model number 55EA8800) in Spring 2014. It's a flat OLED screen surrounded by what resembles a picture frame, except that frame is actually hiding speakers. The really insane news, however, is the announcement of the LG 105UC9. 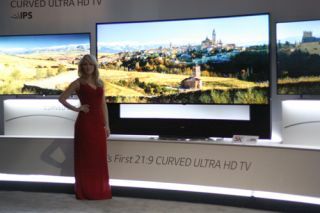 It's a 105in curved LED set with an aspect ratio of 21:9, and features a 7.2-channel system by Harman/Kardon. We're pressing LG for more details on specs, prices and release dates, and we'll be updating this page as we get them.